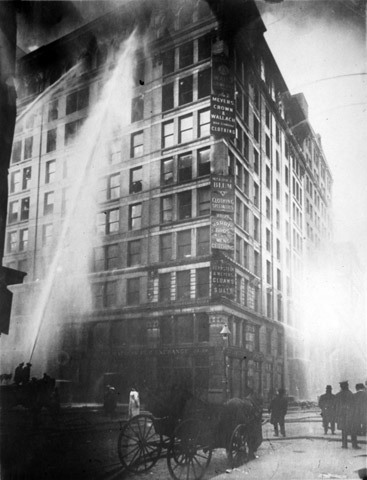 March 25, 2011 is the 100th anniversary of the Triangle Shirtwaist Fire, which claimed the lives of 146 young immigrant women, who worked in a sweatshop in New York. Here is an eyewitness account of the fire, and, agnostic as I am, if you read this and do not weep, you truly have no soul. The year previous many of those same girls had gone on strike, trying to force the men who owned the company to put in safety features, quit locking them in the building during business hours, and various other concessions. 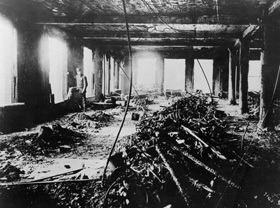 They were not successful, and a year later 146 of them died in some of the most gruesome ways imaginable. Alas, a Blog has the same eyewitness account, and follows up by noting that the owners of the company, in their new location neither fireproofed the new building, nor left fire exits unlocked. For locking fire exits, they were fined $21 and the judge apologized to them for the inconvenience. Amanda Marcotte of Pandagon and Nancy Goldstein at the American Prospect both have excellent articles on it. I don’t have anything really pithy or amusing to say about this. It’s far too serious a subject. What I will say is that this is where the unfettered Free Market leads. This is where the Conservative Agenda is taking us. And I, for one, will not go gentle into that good night. Here’s the article I was talking about earlier tonight. Through painstaking research, they’ve identified the remaining six victims. And tomorrow, for the first time, the names of all 146 victims will be read aloud. Oh agreed. I’ve worked in union and non-union musical gigs before. I think the non-union ones are the reason why I developed severe tendonitis–and almost ripped a tendon. NOt that an RSI is remotely the same, but if management doesn’t have to care about workers, it won’t. This entry was posted on March 25, 2011 by geekgirlsrule in Class, Featured Articles, Labor, Politics.